I have been told to turn to the hukamnama to seek meaning when life makes absolutely no sense. For a very long time I resisted this practice because, I, with my inflated ego, reduced the daily hukamnama to mere advice that maintained that in order to eliminate all pain, be in constant remembrance of Waheguru. I always felt that was a very simplistic and esoteric solution that I didn’t know how to apply to my everyday problems. How can Waheguru be the panacea to all the pain that exists? How does simply remembering Waheguru help me deal with a broken heart after a failed relationship? How does simply remembering Waheguru help me deal with a bad day at work? How does simply remembering Waheguru help me deal with the uneasy and anxious feelings I am occasionally plagued with when thinking about which direction my career should go? How does simply remembering Waheguru help me deal with a verbal dispute I had with a loved one? How does simply remembering Waheguru help me deal with the good and bad that life gives in general? Even as I ask those questions, outing myself as a naive and small-minded human being whose ego drives her every thought, and treating my relationship with Waheguru as a transactional one, I am embarrassed at how little respect I have shown my Guru’s bani. At a fundamental level gurbani does say to be in constant remembrance of Waheguru but encapsulated in that one truth is a richer meaning that I am only slowly starting to parse out. I know better than to treat the Guru's bani as a guidebook to treat symptoms of life’s diagnoses or treat Waheguru as a magical genie of sorts that will grant me wishes if I just pray hard enough to fix my worldly problems. My father always taught me that you don’t need to ask for anything, Waheguru just gives and takes - and that is enough, but most importantly he always taught me and my siblings to seek answers to life’s tough questions within Sri Guru Granth Sahib, the answers are all there if we were willing to look. January 14th, 2016 - a day that felt like the stars would simply not align. One could say, I was just having an off-day, a day amplified by silly and trivial things like an internal voice that poked and prodded me with questions about whether or not I was in the right career space and that I would be better suited doing something else. I ended up slipping on some ice coating the sidewalk as I rushed to catch the city transit so I wouldn’t be late for work (I was still late for work). I later bruised my hand after falling on said slab of ice-coated sidewalk, bursting into a song of profanity that I commonly don't sing as I cursed the subzero temperatures I was forced to travel in. Later that day I failed to meet a deadline at work because I incorrectly wrote the actual deadline in my calendar, all while feeling bouts of unexplained anxiety and sadness throughout the day with no discernible root cause. Certainly there were positive moments that day but of course my mind rushed to acknowledge and hyperbolize the seemingly negative moments. Usually, I will seek counsel from friends and family to complain about things that didn’t go my (selfish) way, or refer to my trove of self-help books that can help me improve every aspect of my confusing life from love to career to time-management to diet and exercise. But that day was different - I felt like maybe I needed to take a different approach on how to analyze my issues than venting to others or poring over books that the self-help industry has inundated me with. My issues I knew deep down were grossly insignificant and could easily be worked out on my own, but that day I thought of my dad and sought to refer to the Guru’s bani. Burn away your hopes and desires, and live like a guest in this world. 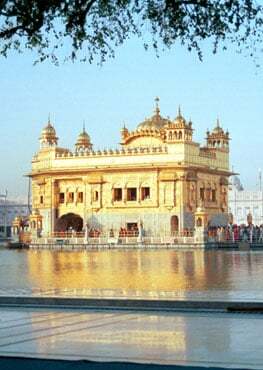 If you walk in harmony with the True Guru's Will, then you shall be honored in the Court of the Waheguru. The notion of burning away my hopes and desires and living like a guest in this world immediately struck me with instant calm. What was I doing thinking and over-thinking about wanting more and stressing over things beyond my control when I could just freely abandon all wishes and wants and submit to the Guru’s hukam and trust that things will be fine-whether they seem good or bad. One could argue that taking that approach to life is the path to complacency, don’t we need to have desires and hope to progress as a species? At first glance, burning away my hopes and desires sounds slightly pessimistic. How can I abandon hope when I don’t get what I want the first try, shouldn't I keep hoping for things? People always tell me to hold onto hope that things will change for the better, have hope when times seem tough, or "hope for the best". I don’t think Guru Ram Das Ji is saying to stop dreaming large, being ambitious or work hard but rather not to worry if things don’t go as planned or as one would hope. I think we have to learn to not have expectations from things or people, we have to do what we can to be great and that is it- no more no less. As I mature and struggle to navigate my everyday world whilst continuously contemplating and grappling with the good and bad that competes in my life and the lives of others, I am finding myself seeking guidance and support from my Guru more and more. I have returned to the daily hukamnama to not just find answers but peace with the truth that the world will rage on but the Guru will always be therefor me, to give and take- and that is enough, and that bani will always help me navigate life, when at times, it can make absolutely no sense.